I want bobbles too, a photo by PhylB on Flickr. My poor baby is desperate for hair. 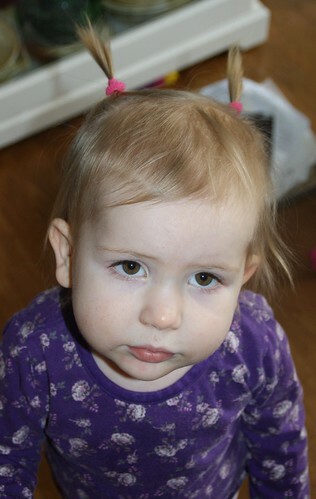 Every day she brings me little bobbles and hairbands and begs me to put them in her hair. I am really struggling but when she looks at me with those big olive eyes and says 'me too bobbles', what am I supposed to do? The result this week was her wandering around all Wednesday looking like an insect with two very sweet antennae.